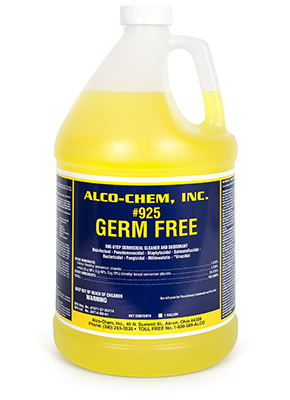 Alco Germ Free - Alco-Chem, Inc.
Quaternary based disinfectant with superior cleaning ability for high soiled areas. This pH 12 cleaner kills a broad spectrum of pathogenic bacteria, virucidal and HIV-1. Effective against H1N1, Influenza A, MRSA, Streptococcus aureus (strep) and Trichophyton mentagrophytes (athlete's foot fungus). Effectively controls growth of mold and mildew.